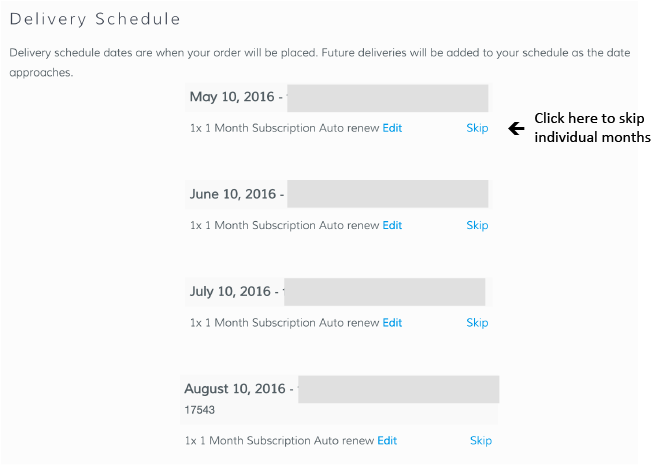 Just log into your account and click "Delivery Schedule" on the left. From there, you'll see all the upcoming months that you are subscribed for. If you want to skip a particular month, just click on "skip" next to the month that you would like to skip. *All Signature Snakku Box subscriptions automatically renew on the 1st of every month. If you would like to skip a month, make sure to make any changes by the 30th or 31st (last of the day month) prior to when your box ships out. (Ex: For the April box, you must skip by March 31st). *Tasting Box subscription automatically renew on the 10th of every month. If you would like to skip a month, make sure to make any changes by the 9th of every month. (For April Tasting Box, you must skip by April 9th). Due to system limitations, if you got our multi-month subscription and need to skip a month, shoot us an email at hello@snakku.com with your order # and which month you want to skip, and we'll make it happen!